Entrusting the care of a loved one to nursing home staff can be a difficult decision for any family member to make. When the decision is made, it is expected that nursing home staff members will strive to provide the best care and protection to a loved one. Unfortunately, a major problem arises when nursing homes are understaffed or are unable to meet professional standards in the nursing home industry. Employees may take out their frustrations in the form of abuse on patients, or they may exploit, sexually abuse, or neglect to provide the proper medications and nutrition to patients. According to statistics maintained by Medicare, there are 1199 nursing homes in California regularly monitored through inspections, surveys and investigations into formally filed complaints. Government inspectors found serious deficiencies and violations at 306 (26%) of California facilities providing substandard care. 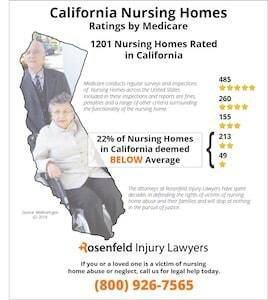 Was your loved one injured, neglected, abused, or did they die unexpectedly from mistreatment while living at a California nursing facility? If so, we invite you to contact the California nursing home abuse & neglect lawyers at Nursing Home Law Center today. Let us begin the process of obtaining compensation on your behalf to ensure your family receives the monetary recover they deserve. Over 132,000 elders are the victims of nursing home abuse in California every year. Federal laws like the Nursing Home Reform Act and California state laws are intended to protect vulnerable residents in nursing homes. 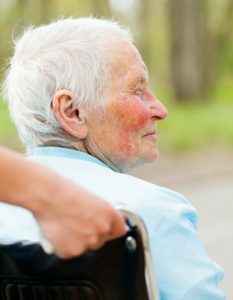 If you suspect that a loved one has been the victim of abuse in a nursing home, then get in touch with a California nursing home lawyer who can help you today. When it is suspected that vulnerable adults are the victims of neglect or abuse, §15700 of the Welfare and Institutions Code in California provides for emergency protective custody of suspected victims. When abuse resulting in physical harm is suspected, the observer should make a telephone report as soon as possible to local law enforcement authorities. The Mello-Granlund Older Californians Act requires ombudsmen to stay aware of the care and treatment of adults 60 or older in nursing homes, and ombudsmen are also charged with the task of investigating reports of abuse. The most common problem impacting residents in nursing homes is neglect. Neglect can occur when a resident has been malnourished, unnecessarily restrained, or forced to consume drugs for no medical purpose. This neglect deviates from the care that nursing homes are supposed to provide under §1250(c) of the California Health and Safety Code. This section maintains that nursing homes are supposed to provide continuous “skilled and supportive care” to residents on an extended basis. Because of their vulnerable state, elders in nursing homes are required to receive 24-hour inpatient care, proper nutrition, medical services, exercise and activity services. Unfortunately, understaffing caused many nursing homes to be unable to provide this adequate care in 2004. In 2004, it was estimated that one out of three nursing homes failed to provide the required minimum of 3.2 nursing hours to patients every day. Call our California nursing home abuse lawyers for a free consultation today. California law imposes upon nursing home owners the duty to protect its residents and provide each patient proper medical care. It is the obligation of the owners, administration and medical staff to exercise reasonable care, ensuring that every resident is protected from abuse and neglect from medical staff, other residents, family members and visitors. Nursing Home Law Center LLC is committed to holding negligent medical facilities responsible for the harm caused to their patients. If you have a loved one with a pressure sore that developed at a California nursing home or senior living facility, we invite you to talk to a California nursing home abuse lawyer today for a free review of your case. Our office handles bed sore lawsuits on a contingency fee basis– where a legal fee is only charged when we are successful for you. Complete our on-line form for a free review of your case. Even with regulating government agencies empowered to investigate and punish medical facilities neglecting residents many patients still suffer bedsores caused by the neglect or inattentiveness of the nursing staff. Bedsores are skin wounds that typically develop on bony areas on the body including the heel, ankle, hip, tailbone, shoulder blades, shoulders, elbows and the back of the head. Pressure sores develop from constant pressure on the skin in a localized area. The sore is the result of restricted blood flow to skin, which can cause tissue to begin dying from lack of oxygen in as little as two hours. Individuals bedridden or bound to wheelchairs are most susceptible to developing the pressure sore because of their inability to reposition themselves without assistance. Most bedsores (pressure ulcers; decubitus ulcers; pressure sores) take a substantial amount of time to heal properly. Nearly all pressure sores are extremely painful and can cause other serious complications including bone and skin infection. Without proper treatment, a pressure sore can become infected creating a life-threatening condition. When patients with existing sores are made to lie in their own moisture, there skin can easily begin to break down, tear or rupture, worsening the condition. Bedsores are typically an obvious sign of neglect of a nursing home resident. Inattentiveness, lack of monitoring or outright neglect is often the result of understaffing or insufficiently trained nurses and nurse’s aides. Most nursing facilities are businesses responsible for keeping stockholders happy. Often times, administrators keep their eyes on the bottom line and hire only a minimal amount of staff, placing profits ahead of the nursing home resident’s safety. Having only minimal staff on every shift is usually insufficient to provide proper care for every resident. 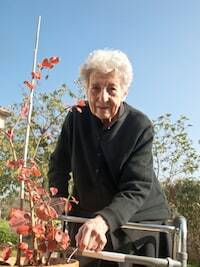 Family members with loved ones in nursing homes suffering a bedsore often suspect neglect from nurses and nursing aides too busy or uncaring to do their jobs properly. Typically, the best solution to help their injured loved one is to hire the skills of an experienced California bed sore lawyer who can take legal action immediately. A pressure sore attorney can take steps to stop the neglect and ensure that qualified professionals are brought into provide proper treatment to heal the sore. If you suspect your loved one is suffering from pressure sores caused by neglect or abuse in a California nursing home, it is essential to take steps now. Schedule a no cost confidential consultation with one of the professionals listed below. Taking action through a California bed sore lawyer can stop the abuse now. The skilled nursing home abuse attorneys at Nursing Home Law Center LLC can provide legal options to obtain financial recompense for family members and the victim suffering pressure sores caused by negligence staff members. If you are seeking information on how bed sore cases have been valued in California, look at our pressure sore case valuation section. Chen, Linda. “Eradicating Elder Abuse in California Nursing Homes.” Santa Clara Law Review 52.1 (2012): 213-254. Print. Medical malpractice – 3 years from date of injury or 1 year from date of discovery, whichever occurs first, except for foreign objects where SOL runs from when object is or should have been discovered. Minors under six have 3 years or until to age eight, whichever is longer, to bring an action. Actions may be tolled for minors where parent or guardian and defendant’s insurer or health care provider committed fraud or collusion in failure to bring an action on behalf of the injured minor. 2 year SOL in elder abuse cases.